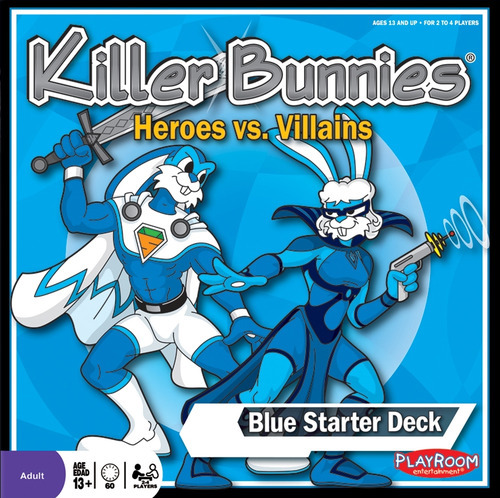 Killer Bunnies: Heroes vs. Villains is a game designed by Jeffrey Neil Bellinger, published by Playroom Entertainment. It is for 2-6 players. It is a collectible non-collectible card game much like the Living Card Games from Fantasy Flight Games such as Netrunner and Call of Cthulhu. For this version, there are two sets of rules, those for tournament play and those for casual play. Tournament play is played exactly like the Ultimate Odyssey version. Those rules and setup are covered in that review. To check it out, follow the link below. In this review, I will only cover the differences in the rules for casual play and what this new version brings to the table. In this version of the game, players will be trying to gain 4 to score, four bunnies in their bunny circle and 4 cities in their city circle. Civilization points will not be used in this version. Their opponents will be using weapons and different scenarios to try and stop them as they also try to score 4. The player that is best able to do this will be declared the winner. Set up is done exactly the same way as the Ultimate Odyssey. See the link above for more info. What’s different about this version of the game are the hero and villain super bunny cards. These are brought out and played the exact same way as any other bunny cards. However the difference is that a side must be chosen to play these super cards. You may only have hero or villains in play at the same time. You can’t have both a hero and a villain card. Each of these cards have super special abilities that can really give you an advantage over your opponent. There’s only one other difference in this version, burning resource card costs. Most of the time you have to pay resources to be able to bring out a bunny, city or weapon. In this version, there are cards that require you to discard one or more of your saved resource cards to be able to play them, thus burning them. The game is over once a player gets 4 or more bunnies in their bunny circle and 4 or more cities in their city circle. Whoever does this first is the winner. This version of the game comes with 3 different 60 card decks, scoring squares for 2 players and dice. This has yellow, blue and green decks that can be used as E decks in the Odyssey version of the game. Like in the other version, the artwork on the cards is really awesome. There’s more humorous artwork and references to pop culture. I’m especially fond of the Time Travelers in this version, as I’m a huge Doctor Who fan. The quality of the cards is the same. Good sturdy cards that stand up well to playing and shuffling. Dice are the same, except these are white and not black like the Odyssey versions. Scoring squares are the same style of thick sturdy cardboard. Everything comes in a nice little insert that neatly packages each deck separately. As with the others, I’d really like to see a storage box that neatly holds all the different decks properly like some of the deckbuilding games do. All in all, I really like this new versions and the super bunny cards. The rulebook for this has 4 double sided rules sheets. Two of which refer to the tournament rules that are the same as the basic Odyssey version of the rules. The other 2 are just for this version and explain how this differs with the 4 to score victory condition. It also explains the new bunnies and burning card costs. One of the rules sheets is for the E deck info. Depending on how you plan on playing, will depend on which sheets you need to read. If you’re already familiar with the game, you will be able to just scan over the different sheets to get the pertinent information. Otherwise, you may need to read each one thoroughly. Just like the other versions of the game, everything is well written and easy to understand with great artwork on the sheets. The game doesn’t really play that much different than the Odyssey version. The main thing that you’re worrying about though is getting at least 4 bunnies and 4 cities out in your circles. This is a really neat way of playing and is a little bit more aggressive than the civ building from Odyssey. You really have to be on top of your game to get ahead of your opponent. Forget thinking 2 steps ahead, you’ll need to think a lot more ahead than that. It’s very chaotic, but that’s really cool. It might be a little bit more difficult than the Odyssey version but for older kids, it should be fine. I really like the addition of the super bunnies and love how much fun they bring to the game. Killer Bunnies Heroes vs. Villains is a light humorous and chaotic game of super powered bunny coolness. The artwork is as cool and possibly even cooler in this version of the game. It averages a little longer than the Odyssey version, with a play time of about an hour. The difficulty is a little harder than in previous versions. I think that fans of the super hero genre as well as Magic the Gathering players will really enjoy the game. It’s a really great game and this version is really cool. I really love the new mechanics and differences that the Heroes vs. Villains brings. If you already like Killer Bunnies, you’ll love this new version. I highly recommend giving this one a try. It’s even better than before. 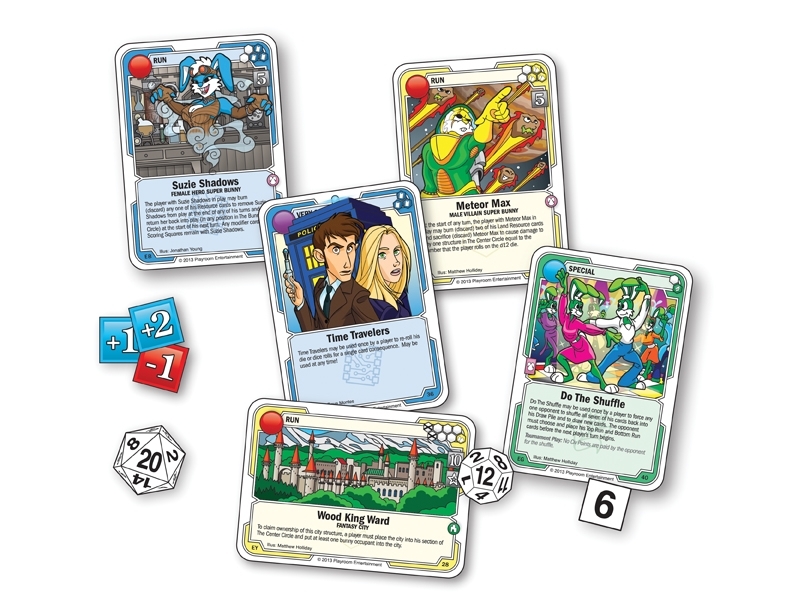 For more information about Killer Bunnies: Heroes vs. Villains as well as different decks, expansions and many other great games, please check out Playroom Entertainment at their site. This entry was posted in Reviews and tagged bellinger, board, board games, bunnies, card, card games, entertainment, games, heroes, heroes vs. villains, jeffrey, jeffrey neil bellinger, killer, killer bunnies, neil, playroom, playroom entertainment, villians. Bookmark the permalink.